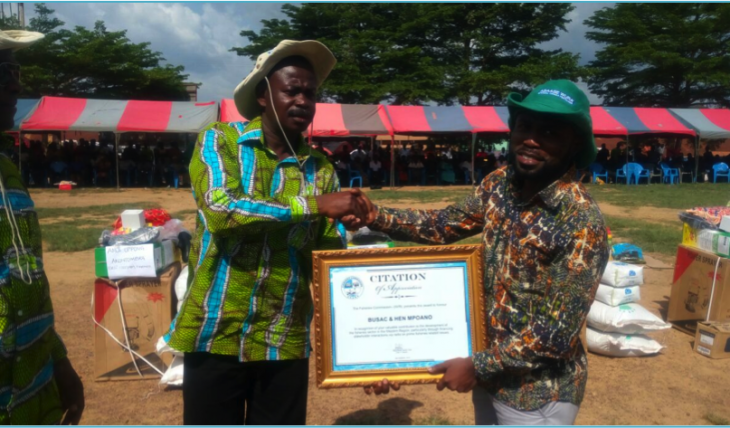 Western Region, Ghana – November 4, 2016 – Fisheries Commission Ghana on Friday awarded a joint citation to the Business Sector Advocacy Challenge, BUSAC Fund and Hen Mpoano, as recognition of their significant efforts towards a sustainable fisheries sector. The recognition was given at the 32nd Farmers’ Day celebration in the Western Region. Presenting the award, the Deputy Western Regional Minister – Alfred Ekow Gyan, acknowledged the role of the two organisations in advocating for sustainable fishing practices to combat Illegal Unreported and Unregulated (IUU) fishing. Farmers’ Day is celebrated every year in Ghana to recognize and reward hard working Ghanaian farmers and fishers. This year’s celebration, under the theme, “Agriculture: A Business Response to Economic Growth” was held in Kintampo, Brong Ahafo Region, and replicated in all regions throughout the country. Hen Mpoano participated in the Western Region celebration in Asankrangwa – Amenfi West District (about 390km from the National capital – Accra) to draw attention to the fisheries sector and the critical role it plays in providing food security to millions of Ghanaians. Ghana’s per capita fish consumption is among the highest in the world at an average of 28 kg per person per annum, which is well above the global average of 20 kg per person per annum. Thus, the role of the sector is far reaching and needs to receive more attention for improved management, particularly, the marine sector, which is near collapse due to issues such as illegal, unreported and unregulated (IUU) fishing, weak governance, overcapacity and overfishing. As a non-governmental organization committed to promoting sustainable management of fisheries and coastal landscape, Hen Mpoano (meaning ‘Our Coast’) received funding from BUSAC Fund for advocacy campaign against IUU Fishing in coastal communities in the Western and Central Regions of Ghana where the practice is predominant. The interventions, coordinated with the Fisheries Commission, have yielded positive results creating more awareness of the issue amongst resource users and other relevant stakeholders, including the media and the Fisheries Commission; leading to the recognition. IUU fishing violates conservation and management measures currently in place in many countries. IUU is recognized as a serious threat to sustainability of capture fisheries due to its negative impact on the ecology of the oceans and economy of fishing nations. Global losses due to IUU fishing alone are estimated between US$10 billion and US$23.5 billion per year with West African waters deemed to have the highest levels of IUU in the world, representing up to 37 per cent of the region’s catch. This is estimated at US $ 100,000 per day, in addition to damage of artisanal equipment in the marine waters of West Africa.